CHICAGO, Jan. 21, 2015 /PRNewswire/ -- United Airlines will treat premium-cabin customers on flights within North America to a brand new dining experience beginning Feb. 1, when the airline elevates everything from entrees to desserts and lighter snacks for United First and United Business customers. Additionally, United will expand North America premium-cabin meal service to include flights of at least 800 miles - or as short as two hours and 20 minutes - increasing the number of flights on which customers may enjoy meals. 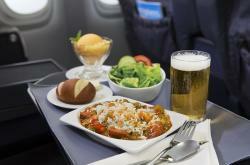 The airline will also offer a greater variety of dining choices. These changes come as United is making a multi-million-dollar investment in in-flight food service. Created by United's team of chefs and inspired by cuisine in the airline's hub cities and other popular North American destinations, United will introduce flavorful new entrees, including cage-free scrambled eggs prepared skillet style with pepper-jack cheese, sauteed pepper mix, sliced New Mexico sausage, potato gratin and fire-roasted pepper sauce; lobster macaroni and cheese with a baked crumb topping and side of broccoli rabe; and chicken and sausage jambalaya with white rice and green onions. Signature bake-on-board cookies in customer-chosen flavors, including triple-chocolate chunk, served for dessert on short- and medium-haul flights that offer meals, or as an afternoon or evening pre-arrival treat on transcontinental flights and flights that link Hawaii with Los Angeles, San Francisco, Denver and Houston. United will also continue to offer premium-cabin customers Prosecco sparkling wine and - on lunch and dinner flights - the airline's signature warmed nuts. A photo of the new chicken and sausage jambalaya is available at http://newsroom.unitedcontinentalholdings.com/foodandbeverages?view=category&mode=gallery. Launch new premium-cabin menu choices on its p.s. Premium Service between New York JFK and Los Angeles and New York JFK and San Francisco. United Airlines and United Express operate an average of 5,055 flights a day to 373 airports across six continents. In 2014, United and United Express operated nearly two million flights carrying 138 million customers. United is proud to have the world's most comprehensive route network, including U.S. mainland hubs in Chicago, Denver, Houston, Los Angeles, New York/Newark, San Francisco and Washington, D.C. United operates nearly 700 mainline aircraft, and this year, the airline anticipates taking delivery of 34 new Boeing aircraft, including the 787-9 and the 737-900ER. United is also welcoming 49 new Embraer 175 aircraft to United Express. The airline is a founding member of Star Alliance, which provides service to 193 countries via 27 member airlines. More than 84,000 United employees reside in every U.S. state and in countries around the world. For more information, visit united.com, follow @United on Twitter or connect on Facebook. The common stock of United's parent, United Continental Holdings, Inc., is traded on the NYSE under the symbol UAL.